Rosemont Media and Dr. Edward Shukovsky recently teamed up to create a specialty website for the Stamford dentist. The new site focuses on snoring, sleep apnea, and getting quality sleep. Through his training and experience with dental sleep medicine, Dr. Shukovsky has been able to help many of his patients attain more restful sleep via treatments for snoring and/or sleep apnea. With a calming and soothing look and feel, the new specialty website features a responsive design, allowing visitors to easily navigate through the site on any Internet-ready device — the layout of the website automatically adjusts to accommodate screens of various sizes, such as smartphones, tablets, and desktops. Visitors to the site can learn more about how much sleep they should be getting, find tips on how to improve the type of rest they get, and discover what may be preventing them from achieving a good night’s sleep. Additionally, several treatment options for snoring and sleep apnea are explained, and potential patients can read through testimonials and reviews to better understand what they can expect. 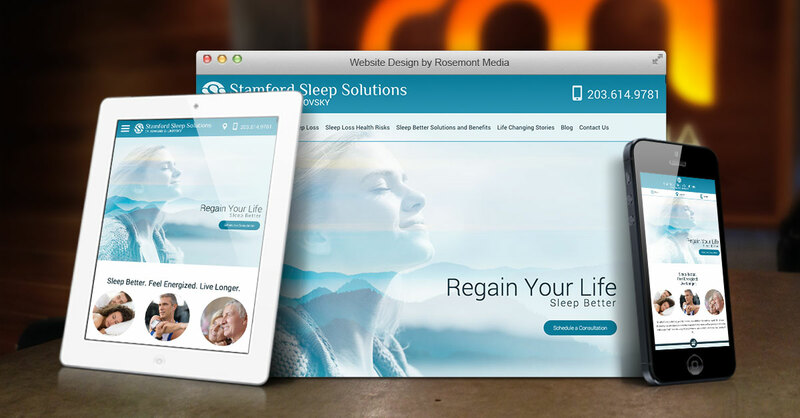 Together, Dr. Shukovsky and Rosemont Media aimed to create an educational resource to help individuals improve their overall health and quality of life through more restful sleep. Armed with the latest dental SEO techniques, this informational website is also built to remain prominent in online search engine results. To see an example of the type of customized website design Rosemont Media can create for you and your dental or medical practice, please visit www.sleepbetterct.com.